This morning my mind has been racing with thoughts and feelings about what I suspect is my next big project. A seed was planted in my heart many years ago and this past weekend it was casually called to my recollection. Over the past two days, I've set it aside to finish the immediate tasks, but this morning thoughts of things to do have come flooding in. Over the years, I have learned that when thoughts come to me with such clarity and in such a rapid stream that it is not my thinking, but it is inspiration from the Lord. Feeling the need to retain and remember all these thoughts while accomplishing today's immediate tasks, I have expanded my usual to do list with a visual work space to collect the thoughts. Scripture study and prayers is always first on my list of to do items. I am currently serving as a Sunday School teacher for the 12 year olds, and so my current study is focused on the New Testament. I opened the Sunday School teacher's manual and started flipping pages to find this week's study material. My eye caught hold of a past lesson titled, "Be Not Afraid." That message sure applies to me! I do not feel qualified for this next project. Then I noticed that one of the focus items for this lesson says, "The Savior can magnify my humble offerings to accomplish His purposes" (Matthew 14:16-21; Mark 6:33-44; John 6:5-14). Another focus item says, "Jesus Christ invites me to set aside my fears and doubts and exercise faith in Him" (Matthew 14:22-33; Mark 6:45-52; John 6:15-21). You probably remember the story of the disciples toiling on the sea during the fourth watch of the night. 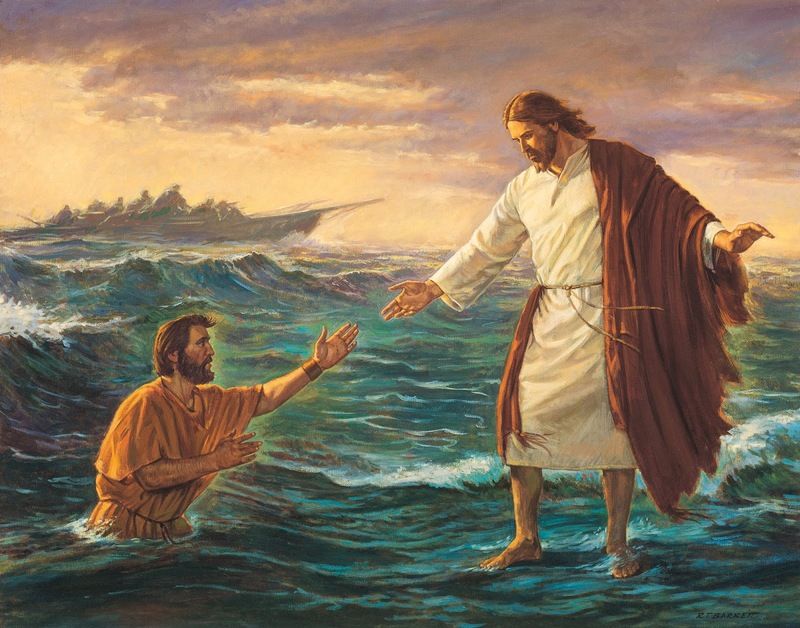 Perhaps you have even imagined as I have, Peter's willingness to walk on the water and yet the fear that caused him to falter as he saw the boisterous winds. 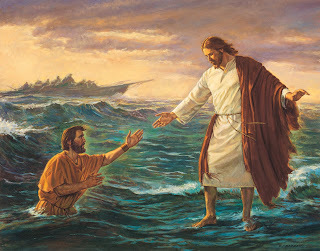 I pray that as I work toward all that He asks me to do, that when I feel I am sinking -- and surely there will be those moments in each of our lives -- I will be like Peter and cry out to Him, "Lord, save me!" What is the Lord inviting you to do that will take courage and help? 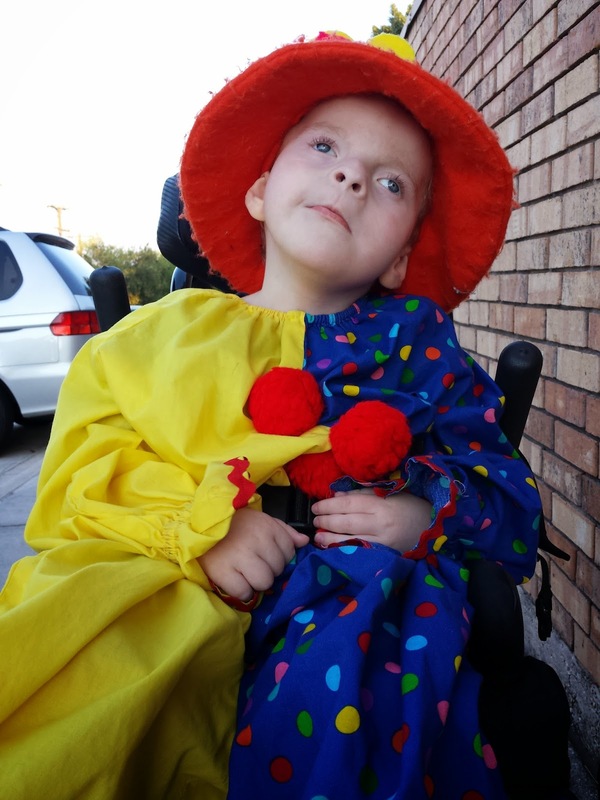 We have been struggling for almost a year now with a pretty important medical issue for Ryan -- his ability to keep his food in his belly. Of course, this can have a cascading effects, especially when it's already on top of his other medical issues. We've been working on this particular issue since January without success. At times it seemed manageable, and during the summer, it seemed it might even be getting better. Coinciding with this has been the challenge to find a specialist that I feel comfortable working with in this area. A few years ago, we had a GI specialist in Austin that we loved, but then she stopped seeing patients to do research. The next doctor we tried was rough. Rough on me. Brilliant man, and at first, I thought I could manage it for Ryan's sake. But, I always left his office feeling like a bad mom. I wanted to ask Ryan's other doctors to call him and just put in a good word for me. After tearfully sitting in the parking lot for 20 minutes following a particularly rough visit, I decided I needed to find another doctor. We received recommendations and a referal for a lady here in San Antonio but her first available new patient visit was in December (FIVE MONTHS away) and they don't maintain a cancellation/waiting list. Resigned, I settled in to wait. I felt okay about waiting because his problems did seem to be getting a bit better. Until Thursday. On Thursday, the problem showed up with a vengeance. I felt discouraged and wondered how we were going to dal with it for another 3+ months while waiting for the GI appointment AND attend school. I started to feel a bit overwhelmed at just all that it could effect when the specialist's office called. They had a cancellation for Friday! Everything about the appointment was perfect. We left feeling hopeful. More than anything, I feel thankful for our God who hears and answers prayers. I wanted to share this here because as I prepared for the appointment on Friday, I was reading through past blog postings and was overwhelmed at just how often our God has blessed us. I know that He is far more generous to me than I deserve. I am so thankful. The Rodeo is a big thing here in Texas and even Ryan is getting into the spirit of things! I recently attended an event where a guest speaker, a father of a young woman with Down’s Syndrome, spoke to the audience about loving someone with special needs. I was excited to attend the event; as you know, it’s a subject that is close to my heart. I am appreciative of the service and the sacrifices this man has made. He knowingly chose his path when he adopted this young girl. I also appreciated his testimony of Christ. To be honest though some of the rest of his comments were concerning to me. Well, if I’m being completely honest, I had to fight tears and if I hadn't been sitting on the front row, I would have left. I thought I would relate to a parent who has a child with disabilities, and I did in some limited ways, but in most ways, I felt a world apart from this parent. I don't consider myself to be thin skinned and I’m not easily offended about my child. I don’t mind talking with others about his conditions or the effects of them. And, I love to talk about him. Thus, I've had to spend a lot of time examining what my issues were with what he shared. And, now, if you will, I’d love to share some thoughts with you. What is a disability? The dictionary defines it as a “limitation in the ability to pursue an occupation because of a physical or mental impairment.” The legal definition is similar but defines a person as being disabled if they have a physical or mental impairment that substantially limits one or more major life activities. We all know that our treatment of those who are disabled has changed over the years. At one time, they were shunned as social outcasts chaining them to a life of poverty. In another time, they were grudgingly tolerated by their families and seen as an economic liability. Perhaps in the worst times, they were treated as “useless” and gassed in euthanasia programs. Today in most cultures, we have seen the effects of the efforts to eliminate prejudices and, while varying degrees of treatment are still seen, many disabled individuals enjoy a better life than those disabled individuals of the past. When my youngest son was about 4 months old, our doctor said, “He definitely has special needs, but he may never get an actual diagnosis.” What does “special needs” mean? In our case, it meant my son, who is now 7, is cognitively aware yet we would have to learn to read his communications. He lifts his eyebrows to say yes, shakes his head if he really means no, sticks his lower lip out to pout, pretends to be asleep if he thinks it’s too hard, and laughs when he’s tickled. 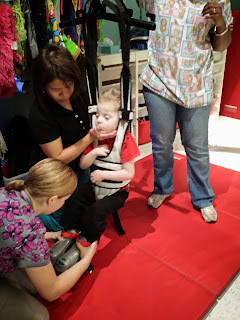 For my son, special needs means that we would need to spend hours teaching his brain how to see images, helping him learn to swallow, moving his arms and legs for him, and generally bringing the world to him to explore. As one can imagine, it has been a growing experience for our family as we have ventured into a world with our sixth child that was previously unknown. And, as I’ve thought about the guest speaker’s experiences and my feelings in response, there are three conclusions I have come to: First, I believe all humans want to be understood. Second, I believe we all want to be seen – really seen. And… I believe we all have special needs. 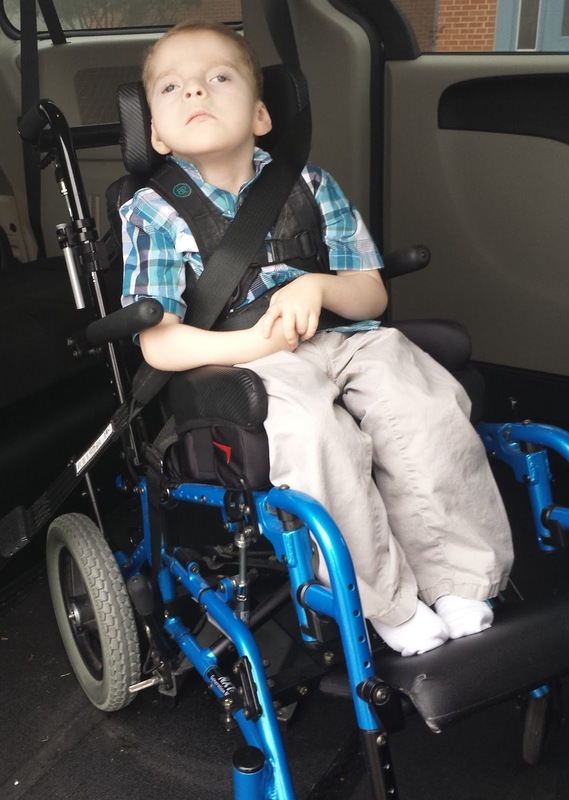 Some when seeing my child, who often is in a wheelchair with unfixed gaze or head down, would be surprised to learn that he has preferences. I’m often asked if my son has a favorite toy. He does not seem to have a favorite toy. (Oh, how I wish I knew for sure!) But, he has a lot of favorite people. He LOVES for people to talk to him, read to him, sing with him, and be with him. He has preferences for books and music. He declares his frustration if I’m not fast enough about turning on music when we get in the van. He doesn't always want to share his stuffed animals with his 9 year old sister. Like so many other children, he can become discouraged or frustrated when we don’t understand. Isn't that what we all want? Don’t we all want to be understood, to have our needs met and to be heard? Don’t we all want to be able to communicate our feelings, thoughts, and desires to others? Can you imagine if everyone just smiled at you, said your name and gave you a quick pat on your head, as if they couldn't really hear you? 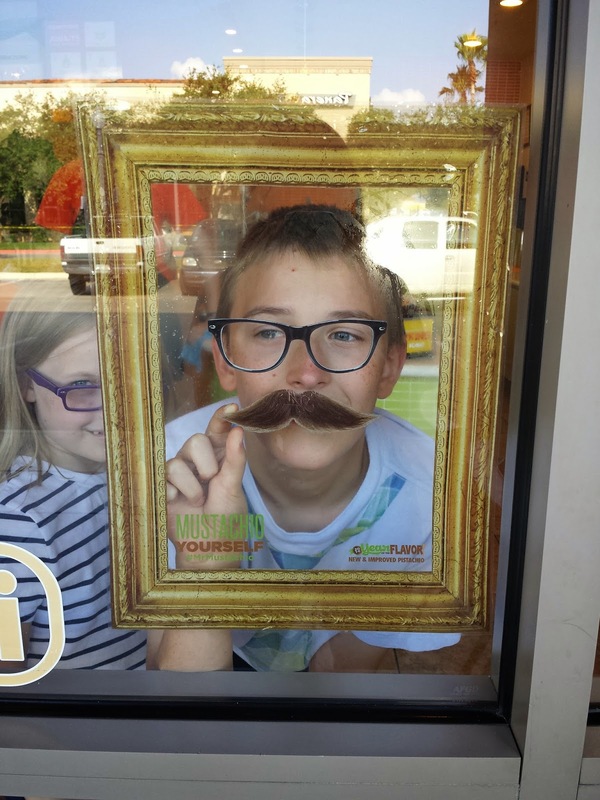 My son has a condition called cortical vision impairment, which means that some days his brain can process the images from his eyes and some days they can’t. This means that I don’t know how much he can see on any given day. I know he can use his eyes to select things from a computer screen on a device called an eye gaze. I know I have to wait for him to find the picture in the books I show him. I also know that sometimes others avoid looking at him. Yet, he wants to be seen. Isn't that what we all want? Don’t we all want to see someone’s eyes light up when they see us? To see a hint of recognition in their eyes? To be acknowledged. What if people looked past you when you entered a room, pretended you weren't there, or averted their gaze? Would you look at others? Would you continue to reach out to others? Would you know how important you are? 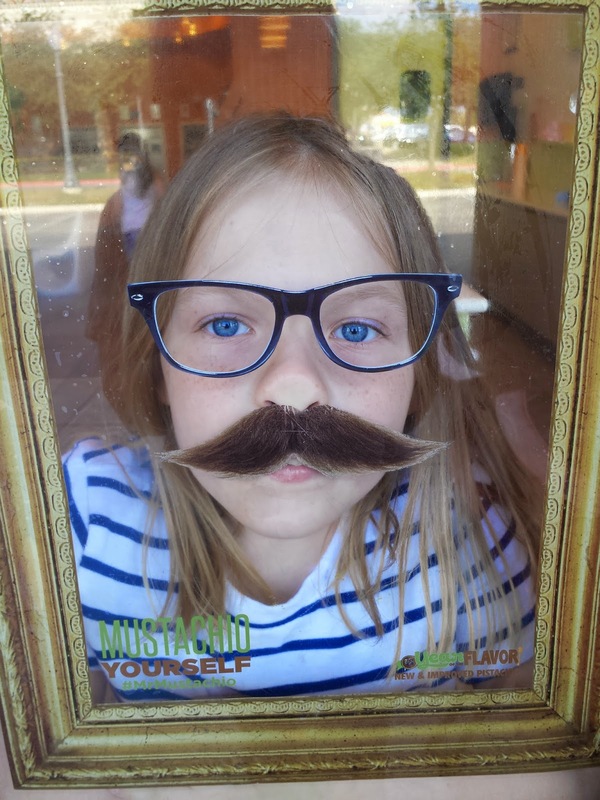 Often there seems to be a fear or perhaps an insecurity of how to communicate with my son. Some well-meaning people respond by just talking to me about him as if he’s not there. Some well-meaning people respond by looking past both of us. And, some bombard me with question after question about his diagnosis – the why’s. Yet, we are all unique and differently-abled. We all have special needs. I do; and, you do. Perhaps they do not fit the legal definition of disabilities. Yet, each of us have special needs that when met we function at our full abilities, and when not met we may not function at all. Some of those special needs may include being heard by others or being seen by others. Yet, there are lots of others. Some may need additional health care to thrive. Some may need others’ patience as they work through grief. Some may need a mentor to age gracefully. Some may need help reaching everything. Some may need a pet to calm their anxiety. Some may need an interpreter to communicate. Some may need others to reach out to them in friendship. For me, it’s hard to articulate my needs. It may sound odd, but perhaps one of my special needs is to be needed – beyond my daily roles. What are your special needs? I believe as we strive to understand and see all the people who cross our paths that we live more rich lives. And, I believe when we acknowledge that we all have special needs and help to meet whatever those needs are for the people in our sphere of influence that we give the greatest gift: unconditional love. I am thankful for the guest speaker who blessed my life and caused me to ponder these things. I am especially thankful for my son and his special needs. My heart swells and my eyes leak when I think about the couple of times when he has fixed his gaze on my face; he has seen me and understood me. I pray I can always do the same for him. During my prayers when I was a little girl I would frequently ask Heavenly Father to pass on a message to my sister. Perhaps I should tell you that I cannot remember a time when I did not believe that we live eternal lives. I believe the veil between us and those who have not yet been born and those who have already lived and passed on is much thinner than we often think. So, when I would pray and ask Heavenly Father to tell my sister something, I believed ... and still believe .. that my sister got that message. One of the men I have loved and adored the most in my life is my Grandfather. Near the end of his life, sometimes he'd hug me before we'd part and cheerfully say, "If I don't see you again, I'll see you on the other side." So, when I came across the song, "See You on The Other Side" by Shaun Canon, it just felt like he had put my feelings to words. You're gonna be back in my life." To some it might be a little unsettling if I were to always leave with the greeting, "If I don't see you again, I'll see you on the other side." But, chances are that if you're reading this, you are one of the people who have impacted my life, someone I love, treasure and care about, and I want you to know how much I care about you. And, even if I don't say it, I'm probably thinking it. So, I want you to know, if I don't see you again here, I will be looking forward to our reunion there. And, if you go before me, please know I'll miss you and I'll be working hard. 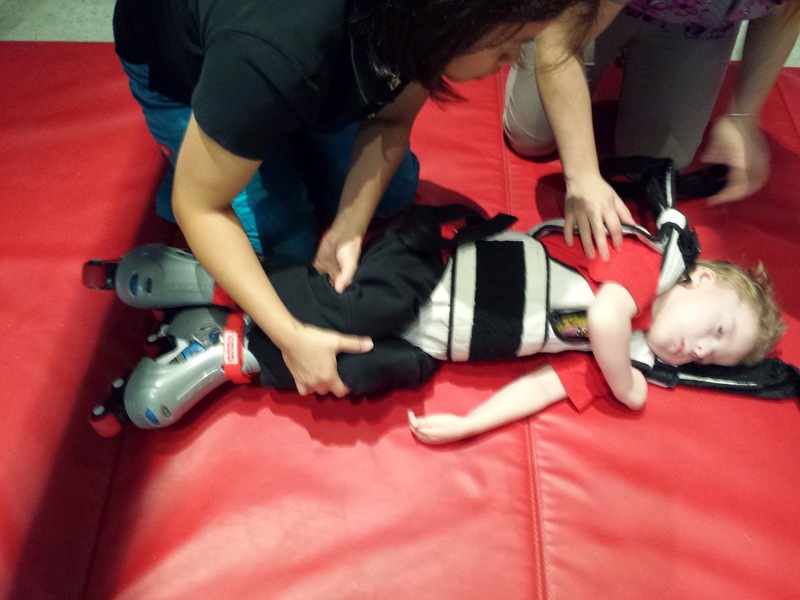 Two of Ryan's physical therapists have recommend a new piece of equipment for Ryan called a Creepster Crawler. The Creepster Crawler is a training device to help children learn to crawl while supporting their trunk. This would be especially useful for Ryan for several reasons. First, it would give him another weight bearing opportunity which will then strengthen the bones in his legs AND arms. Second, it could give him a way to move independently. Third, in technical terms, it will give him proprioceptive feedback meaning it'll give feedback to help him know where his body is in space. Finally, and maybe the most important to Ryan, is that he LOVES moving through space and so he's very motivated, and so we've been really successful with crawling. One of the great things about the Creepster Crawler is that it supports Ryan's weight so that I can then help him with his arm and leg movements instead of trying to do everything with just my two little hands. 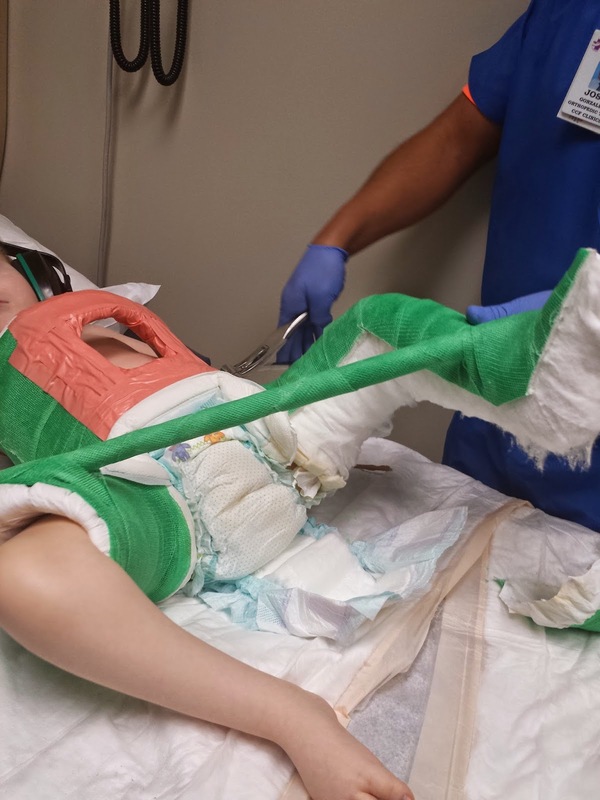 BUT... the physical therapists and our durable medical equipment (DME) provider said insurance doesn't approve them, and they cost about $550. 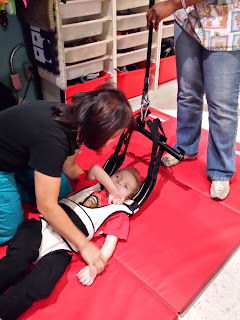 However, our TEAMability physical therapist wrote a letter of medical necessity requesting one for Ryan. I know there's a lot of people who have negative experiences with insurance companies, especially lately. But, today our health insurance provider MADE. MY. DAY!! 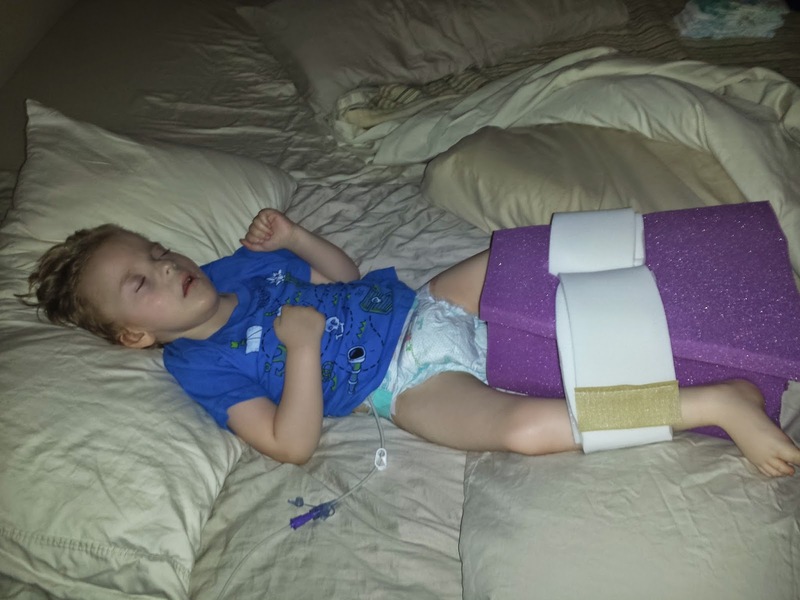 They approved the Creepster Crawler as a medically necessary device for Ryan! I'm so thrilled!!! And, thankful! I can't wait to see what Ryan will do. Seven years ago tonight I sat upstairs at a desk in our game room feeling nervous about the future, but really unsure of why. The next day's events were not a new thing; I already had five other children and four of them by c-section. 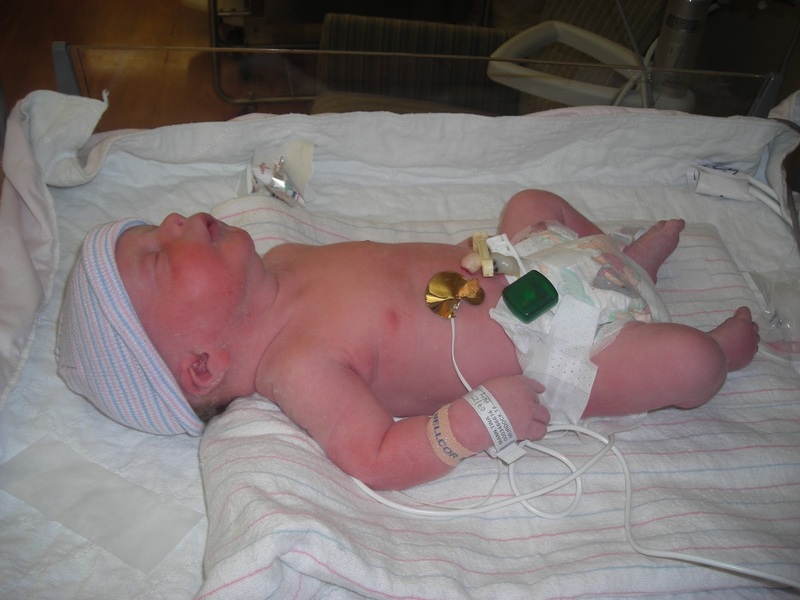 I felt confident in my doctor's and all of the baby's prenatal tests had come back normal. Yet, I had a sense that life was going to change. And, boy has it changed in 7 years! Seven years ago tomorrow, the windows of Heaven opened and I have loved Ryan since the moment I first met him. 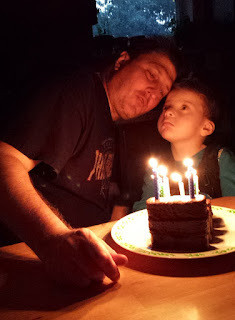 With each child, birthdays feel like a special moment to reflect on not just the first time I got to hold them, but on the passing years. With Ryan, each birthday feels a little extra special. Perhaps not knowing what each day will bring has made me a little more grateful that we made it to yet another birthday. Additionally, since I don't think Ryan marks time with a calendar and I want him to feel really special on his birthday, I have been thinking about and talking about and counting down to his birthday ... well, let's just say A LOT! And, it's made me think ... a lot. Recently, I have read and heard some people question whether God is real, whether prayer works, if God really knows or cares about any one person, and other such things about Him. So, in honor of Ryan, I want to share with you some things that I have learned because of Ryan. I know God has a better plan than I do because when Ryan took his "first steps," my friend was there to record the sweet hug Ryan gave me when he finally made it to me. I wouldn't have been able to focus a camera through my tears and I'm so blessed to have that one moment in time caught forever. I didn't know he'd "walk" that day, but God did and so He made the plan work. I know that God knows me by name because I have had a friend call to say, "Here's the name of a great Pediatric Orthopedic Surgeon and a great Hematologist Oncologist, and here are their numbers." I had just found out that I needed that information, hadn't posted it on social media, or told anyone, but God knew. I know that God knows my needs because I have been rushing out the door to the Emergency Room and accidentally picked up a call on my cell phone. It was my friend (and visiting teacher) calling to check on me. She was then able to help make the necessary emergency arrangements for the other children. I know that God sends angels, both seen and unseen, because I have felt comforted to go to sleep at night knowing Ryan was being watched over. I have seen countless angels perform countless blessings and miracles in our lives, including but not limited to a small army of angels that sacrificed to bless us with Ryan's van. I know that God answers prayers because I have had moments when I have felt the courage and strength wash over me that comes from praying and having others pray for you. The power of prayer has lifted the burdens, given me courage, and strengthened me to do all that is required. On my own, I am not enough. Over the years, there have been comments made to me about what a super mom I am or what an amazing job I do with Ryan. I want to tell you that I am not a super mom and I don't have any super skills. And, if you have ever thought for even a moment that you saw a glimpse of a super hero cape on me, it is His power -- the strengthening power that God gives. I am just a short little girl who really, truly believes that God lives and that He will strengthen me to do His will. I know with every tiny piece of my body that God loves Ryan and that God sent him to earth. I don't know why Ryan came in the body that He did. I have some theories, but I don't know. But I know God does. And, tomorrow we will celebrate and give thanks to God for such an amazing SEVEN years with Ryan! I found this recipe on Saturday at HEB. It is SOOO delicious and tastes like a bite of summer. If you can use tomatoes that are fresh from the garden that would probably be best, but if not, at least use some good vine ripened tomatoes. Toast your sliced ciabtta in the oven until slightly crispy. Dice your tomatoes, and toss with basting oil, balsamic vinegar, basil, salt and pepper. Allow to sit at room temperature for at least 5 minutes. Top ciabatta toast with tomato mixture. Top with shaved Parmesan, optional. I was driving down the road this week, feeling a little overwhelmed with a particular situation, and I was conversing with my Heavenly Father about it. I felt I had lost all power of influence with my friend who has some major stuff going on and I felt incapable of being helpful yet I feel responsible to be helpful. I have invested a lot of time, energy and love into helping this person and so it's tough to watch them make mistakes that may have heavy consequences. Then a scripture that I had memorized about twenty years ago came to mind: 2 Nephi 31:20. The scripture says, "Wherefore, ye must press forward with a perfect brightness of hope, and a love of God and of all men...."
I have always applied this scripture to me -- that I need to be careful not to become discouraged, which is true. But, let me give you a little more of the before and after. Nephi, an ancient Prophet who lived before the time of Christ, said, "... ye have not come thus far save it were by the word of Christ with unshaken faith in him, relying wholly upon the merits of him who is mighty to save." (2 Nephi 31:19). That is so true! This journey has really required me to rely on my Savior and I'm confident that it is through Him I have been strengthened and made more capable than I really am. Then Nephi teaches about pressing forward with a "perfect brightness of hope." I've always applied this to me and my path to eternal life. However, in that moment, I realized that I need to have hope in His power to save my friend, and not just kind of hope for it, but have a "perfect brightness of hope." And, that hope needs to be powered by a love of God, AND a love for all men, including those who are making decisions that I feel frustrated by, don't agree with, can't relate to or just simply don't understand. Nephi continues on to give some important direction as to how we can do this seemingly hard thing. He says, "Wherefore, if ye shall press forward, feasting upon the word of Christ, and endure to the end..."
So, in the scriptures, if statements are typically things we should or should not do followed by a then statement of the consequences -- blessings when we follow commandments and consequences when we choose not to follow. I have come to really know the power of this if statement -- "press forward, feasting upon the word of Christ..."
Then Nephi gives us the promise that will follow our steadfastness -- the then statement. He says, "behold, thus saith the Father, ye shall have eternal life." Isn't that what we all want? Nephi gives one more thing to remember: "And, now, behold my beloved brethren, this is the way; and there is none other way nor name given under heaven whereby man can be saved in the kingdom of God." I can't save my friend, but He can. And I can work to be "steadfast in Christ" and to maintain a "perfect brightness of hope." I can work to show my love of God and to show love to all people. I'm so thankful for being a merciful God who teaches me line upon line. I'm so thankful for the counsel to memorize scriptures. I'm thankful that when I needed to be taught the Holy Spirit was able to use this scripture that I had memorized about two decades ago to strengthen and encourage me. In Ryan's nearly 7 years of life, I have never once had a dream that included him walking or independently moving. Please don't misunderstand. I would *love* for Ryan to be able to independently move himself. I have just never seen him do it, even in my dreams. I've had two friends who have seen him walking in their dreams and that's awesome. I just have never had the experience. This afternoon, after getting Ryan's new DMO (aka his "dive suit"), we were both resting. I must have drifted off to sleep while reading. I saw Ryan ... as clearly as I see him right now ... in his wheelchair. He was using his arms to move the wheels on his chair. What a vision. I hope to really see him doing that someday. No, we're not taking Ryan diving. (However, that would be really cool if we could.) This "dive suit" is actually a dynamic movement orthotic or a dmo suit. It's also sometimes referred to as a dynamic lycra orthosis or a dynamic elastomeric fabric orthosis. Those are the fancy names for it. Dive suit sounds so much better, doesn't it? And, it kind of looks like a wet suit, a shorty, right? So, why is Ryan wearing a dive suit? Well, the fancy reasons are: proximal control, core stability, biomechanical re-alignment, improved posture, dynamic balance, improved muscle function, improved muscle tone. 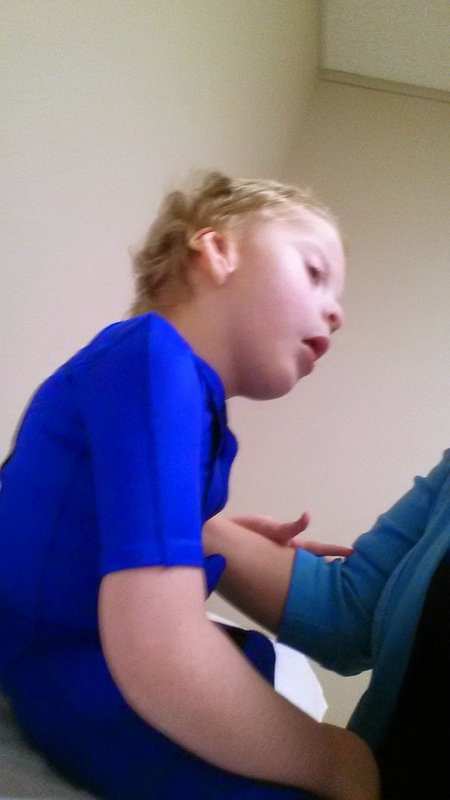 When we sat Ryan up, I put his hands down on the exam table and reminded him that he could push through his hands to help keep himself up. Normally, without the dive suit, Ryan sits in a C shape and needs maximum support. He can't sit at all by himself. Normally, when I put his hands down and remind him to push through them, he pulls them back up off the table. And, normally, he rests his head on me while I support him. NOT THIS TIME! When I reminded him he could push, he pushed! He was able to sit (almost) straight up and hold his head up for several seconds. He loved it, too. When I laid him back down to rest, he'd rest for a couple of minutes and then try to get himself back up. Isn't that cool? I'm so thankful for the people who design these awesome medical technologies, the investors who believe in them, the engineers who perfect them, and the doctors and therapists who know when to use them. We live such a blessed life! It's a lot of work, but he loves it and he's always so proud of himself. Of course, we are too! It's just amazing to see the things he can do. If anyone ever tries to tell you that a child in a wheelchair can't do things ... well, don't believe them. They're in there and just cause they can't talk like we do, or can't walk like we do, well, their potential is unlimited. Just like your's and mine. Thanks, TeamAbility! And, thanks to all of you for all your prayers, love and support! And, thanks for always sharing our joy! This is especially awesome because we have worked for a long time on using switches to be able to communicate and today we integrated the use of a switch with the ability to move. Oh, it's so exciting and I feel so blessed to have people like the amazing team at TeamAbility to work with Ryan! Ryan was so excited about "walking" around the room; he made two full laps. That's a lot of work! Just holding his head up is a tough job for Ryan. I'm thankful he's such a trooper!! You may be familiar with the 1950's radio program called This I Believe. Perhaps you already know that NPR sponsors a national This I Believe project and you can read or listen to them by clicking here. I'd encourage you to read some of the essays and maybe even consider submitting your own. This week in my college class we were asked to write our own This I Believe essays. I believe in visiting with people, empty handed, but willing to work. I suppose I can blame my parents for this predicament. When I was a kid, we would spend hours visiting with people. Sometimes we would just drop by and chat with them. I don’t remember my parents ever asking, “What can we do to help you?” More often than not, mom or dad would just notice something that needed to be done, and we’d get right to work. As I grew up, I started to notice that other women always brought a little goodie when they’d stop to visit a friend. One of my first visiting teaching companions showed up at an appointment with a cute, brown gift bag rustically tied with raffia. As she apologized for having to “throw together something,” the escaping aromas gave away the secret of fresh baked peanut butter and chocolate goodies. This wasn’t an isolated incident. Over and over again, as I went to visit families, other women in the companionship would show up with little bundles of home baked goodies. I started to wonder if I had missed the rule that required all sisters to present goodies when visiting another home. My empty hands felt insufficient. Sure, I was capable of pulling together a meal for the homebound family, but I didn’t feel as confident about whipping up a batch of cookies every time I went to visit someone. I settled on taking jars filled with small candies, flowers, and re-plated store bought goodies for special occasions. During one early morning presidency meeting, the President had mentioned that a family in our ward was having a particularly hard time. When the family didn’t show up at church, I thought about them all afternoon. I wanted to do something to lift their spirits. I wanted them to know they were loved! It hadn’t been too long, since I had taken a jar of candy, I wasn’t prepared to make an entire meal, and since it was Sunday, I couldn’t go buy flowers. What could I do to help? I turned to every woman’s inspirational site: Pinterest. Like most other LDS woman, I had pinned lots of yummy things; however, for me, Pinterest was much like a library full of beautiful books, purchased but never opened. This time, being desperate, I was motivated to actually try a recipe. I decided on the sophisticated sounding Chocolate Chip Bacon Cookies. The blogsters all described them as “salty and sweet with smoky undertones.” Who wouldn’t love that? Each mound of cookie dough baked to the perfect golden brown with chocolate chips peeking through in just the right ratios. I gathered my family and we taste tested the cookies. We each enjoyed a few, warm from the oven, plated a dozen, and proudly delivered the perfectly shaped cookies to the needy family. I was so proud of my unusual triumph in the kitchen that I dropped off a couple of bundles around the neighborhood. The next morning my oldest son noticed an awful smell coming from the cookies. I thought he was imagining things, but when I tasted one, the smell seemed to reflect the rancid taste. Oh, my! The cookies that looked Pinterest perfect yesterday were definitely disgusting today. I immediately imagined the warning phone calls from one family to another: “Don’t eat the cookies!” I could only hope my Pinterest failures were enjoyed immediately and not left to stink up their kitchens. One day not long after that experience, I was thinking about a time that me and a friend stopped to visit a pregnant mom with three little children. As I sat with the mom, my friend noticed the kitchen was in disarray and she started cleaning it as we visited. We didn’t stay too long, but before we left we had cleaned the kitchen and the family room. It felt good to leave the mom’s home knowing that she had been relieved of a couple of burdens. I realized that while I love the goodies that some women bring, what I do best is visit, empty handed, but willing to work. Ryan has been running high fevers off and on since last Saturday. We went to see the Pulmonologist on Tuesday and he gave us a thumbs up. His lungs sounded clear. So, we we went to see the Pediatrician today to see if perhaps it was just viral. 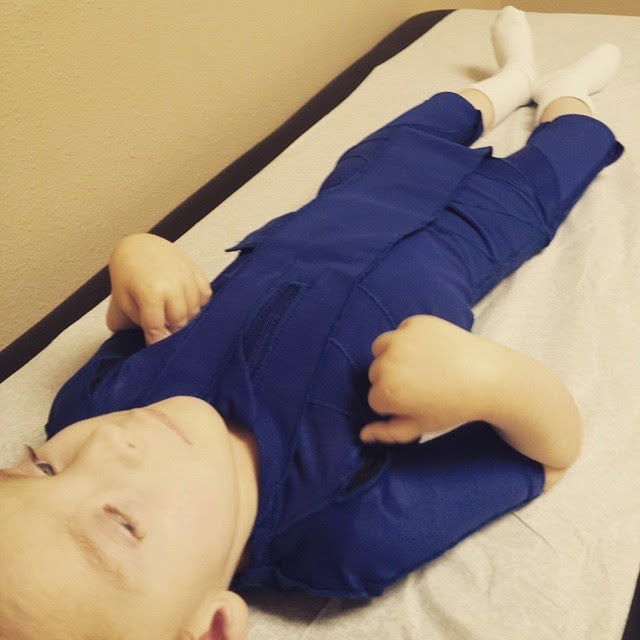 Since his oxygen saturation levels were low, the doctor ordered chest xrays and more blood work. The chest xrays came back with pneumonia in the upper right lung. Thankfully, we have excellent doctors who talk to each other and we have a plan of action to keep him at home and out of the hospital. About two hours after we got home, Dr. Rhame called to let us know that it's walking pneumonia which requires a different antibiotic than we had started. It's not a big deal, just a minor change. Hopefully, we'll get this guy feeling better soon. He sure has had a rough few months. 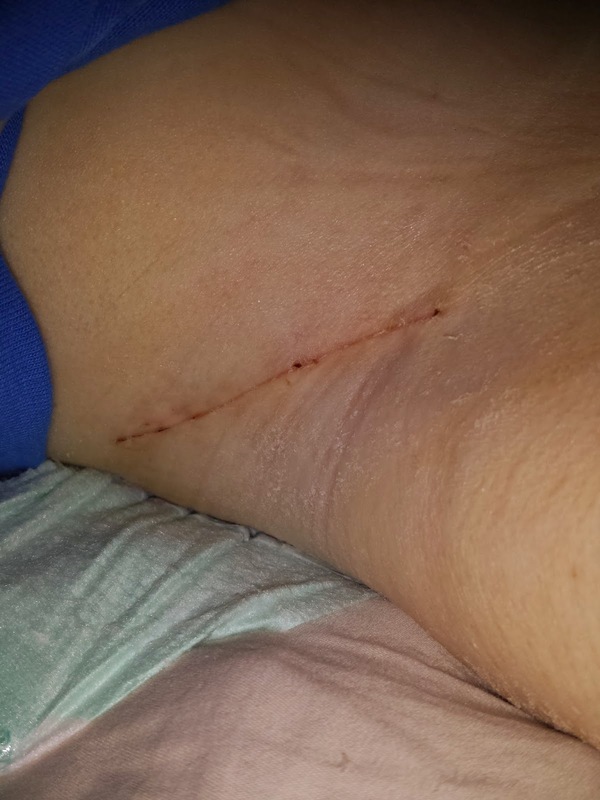 We had our two week post-op follow up with Dr. Magnabasco today. I did an interview with a nurse while we went to the appointment. 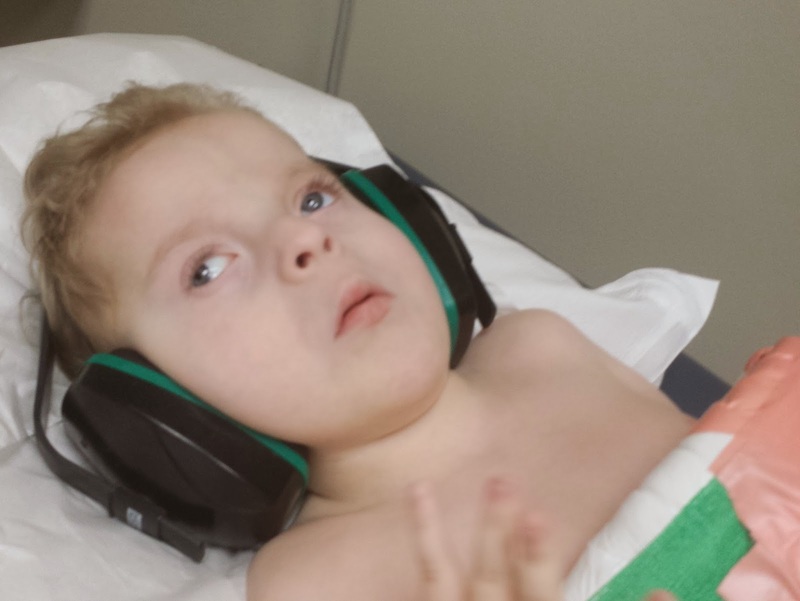 (Ryan has been without his regular nursing care since the first surgery a month ago. Bad timing.) I usually do a 2 hour meet and greet/orientation at the house with nurses to interview them, but the agency has been sending out people are not even a close match and I just frankly don't have the extra 2 hours to spend with someone if they can't even work the necessary shifts. So, I decided having them come along with me to appointments is a good way to see them in action, and I get the added benefit of having someone available to help me lift the wheelchair in and out of the van. Thankfully, the interview went well and today's candidate may be a good option. After a long wait, we were greeted in the hall on the way back to our room by Dr. M. She always treats Ryan like a rock star. She indicated we were removing the cast and I felt a small surge of panic. Oh, my! We were originally told 6-8 weeks, but since we're really good at following directions and he won't be weight bearing, she felt he could be out at 4. That's just 2 weeks post-op. I'm a bit nervous about it but she assures me it would take deliberate attempts to mess it up. Okay, I trust her. So the cast tech gave Ryan these cool headphones to wear so he wouldn't be bothered by the noise. (Since he didn't have in his hearing aids, I don't think the noise would have bothered him anyway.) He looks awesome, right? .... and pried it open. 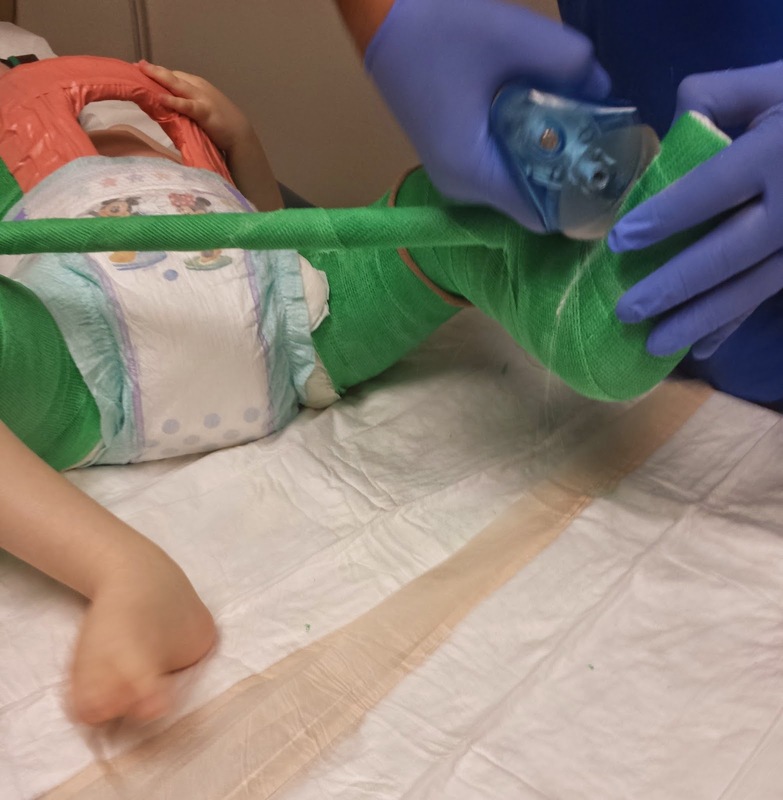 Dr. M was right the inside of Ryan's casts are really clean. Excuse me while I pat myself on the back for that. Then he cut through the thick layers of foam and lining. The top part was pretty easy to remove. Unfortunately, it wasn't as easy for the bottom piece. It was very awkward and difficult to get the bottom piece out from under him. 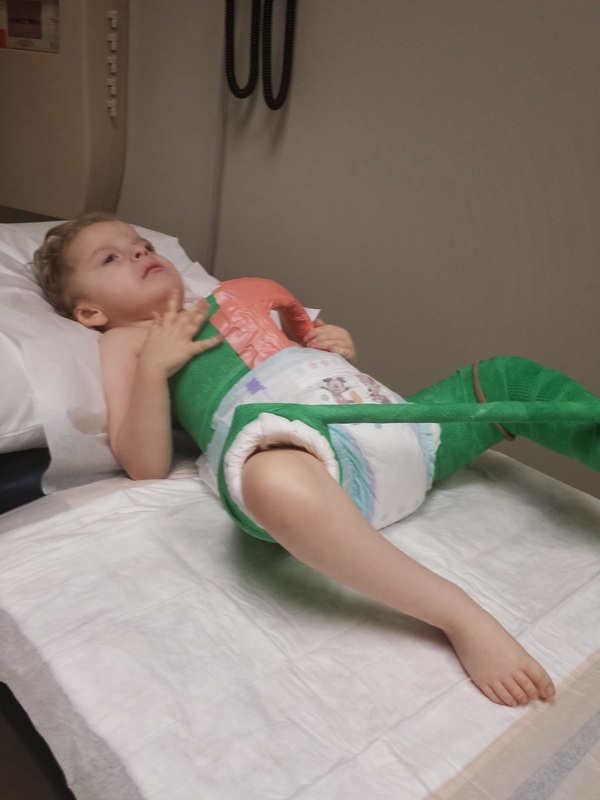 I thought Ryan would be thrilled to get the cast off, but once we really started removing enough pieces to wear his legs were no longer in the supported angled position, he cried. And cried. And cried. Apparently, all the kids do. I wish I had known. Remember the purple triangle thing from the hospital? Well, it was trimmed down to fit him and we're now to use it pretty much anytime he's sitting in his chair or lying down etc. 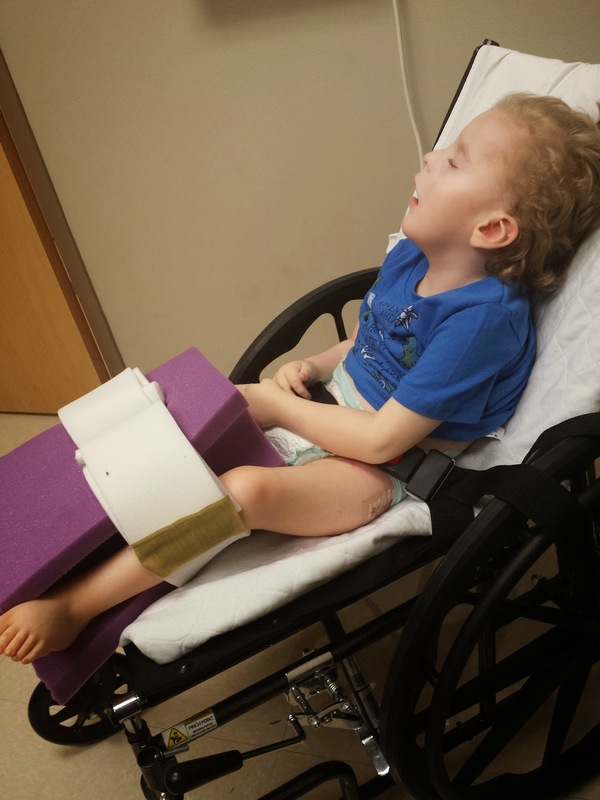 He doesn't have to have it all the time, but it will help support him and help with proper positioning of his legs for him to finish his recovery. After Dr. M put it on him, she moved him to the chair for me. He cried more. It was hard to tell whether he was crying because he was nervous about the movement or if he was in pain. But, once we got him into the chair, he calmed (as long as we didn't go over any bumps). Unfortunately, I had to lift him out of his chair and put him in his car seat. He cried and cried, and this time I could tell it was a pain cried. This was one of those moments when I really wish we had a wheelchair accessible van. It sure would have made it less painful for Ryan. After crying for the entire drive from downtown, I got him settled into bed and gave him pain meds. He slept for most of the day. Tonight as he's been waking, he's required more suctioning than normal, which is confirmation that he's struggling a bit physically. So, I think I'll keep him comfortable with the pain meds tonight. I thought diaper changes would be back to normal out of the spica cast, but I think it's going to take a couple more weeks. Well, I'm grateful to be this far in the journey. Another month will go just as fast, right? Please pray that his healing will go well and that he'll be stronger when this is done. And, if you don't mind, say a little prayer for me, too. 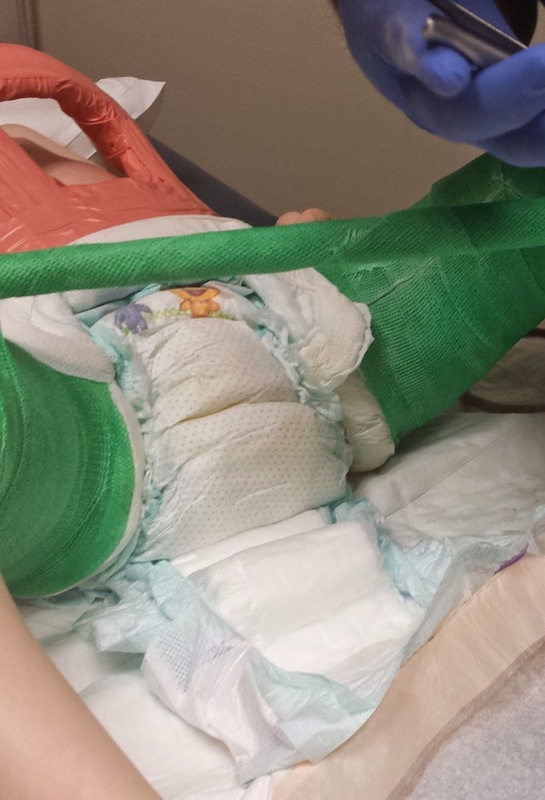 So, diapering has never been fun, but with a spica cast it takes on a new challenge. Since it's really important to keep the inside of the cast dry, diaper changes need to happen frequently. Even with frequent diapers, the risks of getting things wet or stinky and dirty are pretty high. So, here's what we did this time. We use an extra small diaper on the inside of the cut out and a really large diaper on the outside. So, for Ryan who is about 33 pounds and 6 years old, we used a size 3 Pamper for the inside and a size 6 Huggies diaper on the outside. The two diaper system works pretty well most of the time. 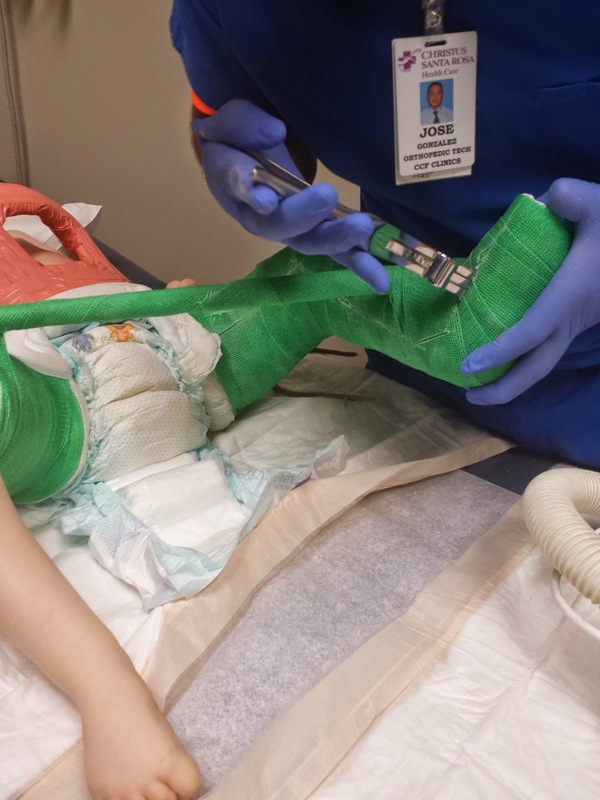 However, if his little boy parts were not positioned just right, we had an issue with urine going up into the cast. To solve this issue, I used a maxi pad without wings to line the top front portion of the cast, being careful to only stick it to the cast and not his wound dressing. This created another barrier. We also found that sometimes stinky and dirty "things" would get on the edge of his cast on the backside. To make for easy clean up, we just lined the edges with mini pads. This also helped to prevent the cast from bugging his skin. I never thought I'd store maxi pads in my family room and I never thought I'd hear myself say to my 15 year old son, "No, that's a mini pad, I need a maxi pad." And, I never thought my 6 year old son would need them. But I sure am thankful for their helpfulness! My Mom came out to help with the second surgery. It sure is a blessing to have good parents that are willing to make sacrifices. I'm blessed with such parents. My kids were really looking forward to Nana arriving and although Papa couldn't come as well, we know it was a sacrifice for him to have Nana here and appreciate him as well. 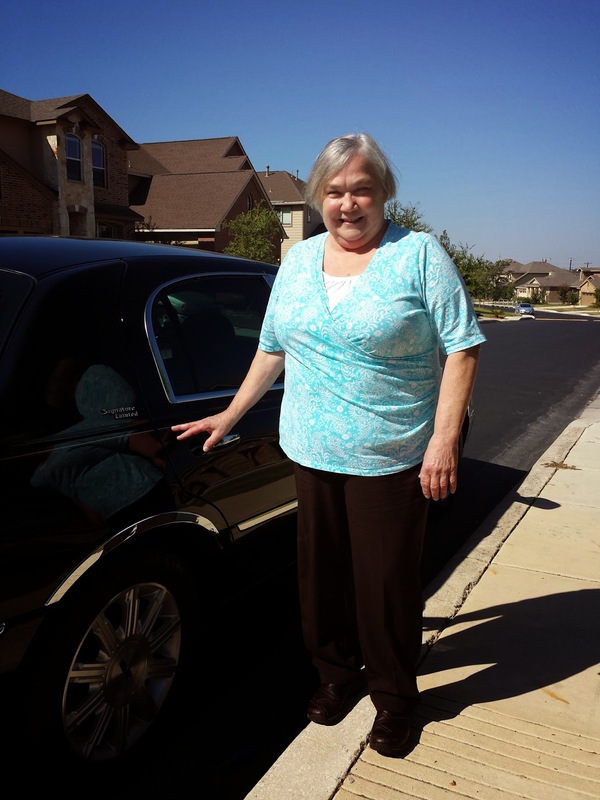 We hope you enjoyed your ride, Nana! This blog was created by Tina who is shrinking in height but not duty. Simple theme. Powered by Blogger.